Be the first to share your favorite memory, photo or story of Edvins. This memorial page is dedicated for family, friends and future generations to celebrate the life of their loved one. 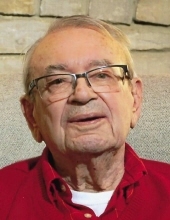 Edvins Svilpe, age 93, a longtime resident of Kalamazoo, MI, formerly of Latvia, passed away on Saturday, January 12, 2019 at his daughter, Laurie's, home in Naperville, IL. He was born June 8, 1925 in Tervete, Latvia. Beloved husband of 67 years to the late Lucie Svilpe (nee Colson), who preceded him in death on January 11, 2018, loving father of Alain (Teresa) Svilpe of Mattawan, MI, Laurie (Daniel) Bachleda of Naperville, IL and the late Claude Kiewiet, adored grandfather of Elizabeth Burke of Raleigh, NC, Stephanie Kiewiet of Seattle WA, Michelle Svilpe of Mattawan, MI, Lauren (Joshua) Morar of Yorkville, IL, and Michael (Kristina) Bachleda of Montgomery, IL, cherished great-grandfather of Madison and Monroe Morar, devoted son of the late Vilis and Lucjia (nee Brikmanis) Svilpe, dear brother of Gonard Svilpe, fond uncle, great-uncle and friend of many. Edvins met his wife, Lucie in France after the end of World War II. On November 24th, 1951, they were married in Damare, France. In search of a better life, they emigrated from France to Kalamazoo, MI, in 1956, where they raised their family. Edvins became a United States citizen November 19, 1965 and was very proud to be an American. Edvins retired in 1990 after many years of employment with Stryker Corp., Kalamazoo, MI. He was a member of the Fourth Reformed Church, Kalamazoo, MI and enjoyed baseball, woodworking, reading, ballroom dancing and gardening - especially growing roses. He loved opera and classical music, enjoyed bird watching and feeding the local stray animals. Edvins was an avid student of world history and loved to engage in discussions of world affairs. He will be fondly remembered and dearly missed. Services will be private. There will be a private inurnment at Mt. Ever Rest Memorial Park in Kalamazoo, MI. To send flowers or a remembrance gift to the family of Edvins Svilpe, please visit our Tribute Store. "Email Address" would like to share the life celebration of Edvins Svilpe. Click on the "link" to go to share a favorite memory or leave a condolence message for the family.